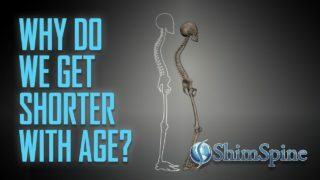 Why do we get shorter as we age? First of all, I want to make it clear, I am talking about your height, or how tall. 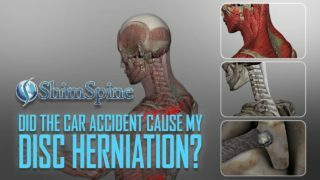 I am Dr. John Shim and I hope you have already had the opportunity to review my video’s about basic spine anatomy and why disc’s degenerate. Understanding those concepts are helpful to understanding the explanation the common question of “why do we get shorter as we age?”. Besides the spine, there are other reasons why we get shorter, but we will concentrate strictly on the spine. In the Disc degeneration video, the concept of disc dehydration, and the resultant narrowing of the disc space was presented. As the animation will demonstrate, the once tall, normal sized disc of our youth will give way to a dehydrated, bulging and narrowing disc. The disc height can reduce significantly. The vertebral body sandwich, or functional spine unit is composed of the vertebral bodies alternating with the intervertebral disc. There are some population differences, but most collected anatomy data indicate a normal disc height for men averages about 11 mm, and women 9 mm. Population studies have definitely demonstrated a narrowing, and degeneration of the discs with age. Interestingly, not every disc in every person will narrow. But in General, the disc narrowing will occur in almost every person. The current conventional wisdom is that after age 40, we shrink an average of ¼ to 1/3 of an inch every decade. In addition to the disc decrease, there is another effect secondary to the change of the shape of the disk, and the functional spine unit. When young, the spine has a natural three smooth visible curves orientation. The neck, or cervical spine gently curves backward. The upper back, or thoracic spine curves forwards. The lower back or lumbar spine curves backwards. The backward curves are called lordosis. The forward curve is called kyphosis. In the normal situation, the head is balanced over the pelvis, and this allows the most efficient use of body energy to maintain property body mechanics and orientation. As the discs degenerate and narrow, it causes the the lordotic curves to straighten, and the kyphosis to become more curved. As a result, to keep the head positioned over the pelvis, often times, the knees and hips need to be slightly bent to maintain the proper position, and balance. This change of posture also results in the “shortening or shrinking of the height”. Osteoporosis can also be a significant contributing factor to shortening. The bones collapse, causing loss of height, and also causes more kyphosis. As discussed before, the body must compensate for this kyphosis by again bending at the hips and knees. As you now understand, the disc degeneration process leads to shrinkage or shortening by both a reduction in height, and a change of the posture to achieve a balanced position. Osteoporosis can also make a significant impact on the height. There are other factors that contribute to shrinkage like loss of cartilage height in our hips, and knees, or falling of our arches in our feet. But as a spine surgeon and specialist, I can say the most significant factor causing age related shrinkage is your spine. I hope you have a better understanding of this process. This is Dr. John Shim. Thanks you for your attention. As a practicing Orthopaedic Spine Surgeon, I often get back x-ray reports indicating “Loss of Cervical Lordosis”. As most of my patients are highly educated, they often will read that report, and will come to discuss the finding. So, I thought I would share my comments on the topic. As some of you may know, Lordosis is the curvature of the spine in the sagittal plane ( simply stated, the side view), by which the front portion of the curve points to the front of the body. Humans typically have four curves when viewing the spine from the side. Going from the head, the first curve is a lordosis curve from the skull to the lower neck. Then, there is a compensatory curvature in the opposite direction (kyphosis) from the lower neck to the upper back. Then, there is another Lordosis curve from the upper back to the lower back. Finally, in the tailbone, there is a reverse curve (kyphosis). When you measure the effects of the four curves when standing, in general, you have a situation where the head is then balanced over the pelvis, and the center of gravity of a normal person will be positioned directly in the center of the body. With that effect, when standing straight up, your body will be balanced over the center of gravity, and there will not be the forces pulling you, or pushing you in any direction. But, when we have irritations of parts of the spine, it can cause this natural gentle curve to straighten. Often times, when people have irritation to the neck muscles, an x-ray or MRI can show loss of the normal lordosis. For most normal humans, without any degeneration of the disks, fractures, or symptomatic disk herniations, these muscle irritations do improve and usually, the lordosis does return. But, if we have progressive disk degeneration, or a break, or arthritis, the lordosis may decrease, or reverse permanently over time. So, when I review an MRI or x-ray, and I see reversal of lordosis, it does not necessarily mean it is a new finding. If the advanced degenerative findings are present, loss of lordosis is expected. Other factors to consider when discussing Lordosis, especially in patients without significant pain, is a positional nature of loss of lordosis. X-rays and MRI’s can be taken when lying down. In that scenario, the position of the neck can cause the image to look like a loss or reversal of lordosis. Also, in relationship to the lumbar spine, sitting MRI’s often will show a loss of lordosis. In summary, loss of lordosis can and usually is associated with irritation of the muscles causing loss of the normal curvature. Muscle irritations can be caused by disk herniations, muscle sprains, and fractures. But, true structural permanent loss of lordosis is usually secondary to advanced degeneration, or structural changes to the bones, and disks of the spine. In rare instances, humans can be born with a loss of lordosis. This loss of the cervical lordosis is something my chiropractor has told me exists in my spine. I actually am curved in the opposite direction. The pain and spasms in my neck have become almost unbearable. I have been to pain management but I need to know if anything can be done to reverse this. What do you do in your clinic for this problem? I live in Winter Haven, about an hour outside of Tampa, and I would like some answers before I make that drive. I am 67 and have Medicare and Cigna for my secondary insurance, do you take these. I also just had a new MRI last week. I can pick up the disc & report anytime. Good morning Linda. We are not contracted with Medicare or any secondary insurances. Most often the reversal of lordosis is caused by spasm so you would need to find out what is causing that. Please feel free to call us for an appointment if you are able to see us. We charge a fee for an hour of Dr. Shim’s time. He examines you, reviews all films and goes over your options. I hope you can see us. For any questions, please call the office and ask for me. 813-814-9251.